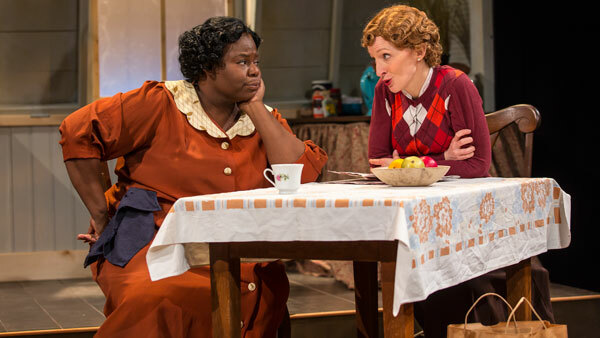 From left, Lisa Gaye Dixon and Emily Dorsch perform in the Kitchen Theatre production of “Black Pearl Sings!” by Frank Higgins. The play uses both music and acting to tell a story of death and race. In an intimately packed theater, the crowd nervously sings along to “Kumbaya,” led by waving, shaking hands. The subtle penetration of the fourth wall is not the focus, but rather the focus is on a deeper meaning that brings the audience to near tears. Yet the tears are simultaneously joined by boisterous laughter. This convergence, equal parts sobering and laugh-inducing, is constantly at the forefront of the play “Black Pearl Sings,” written by Frank Higgins. “Black Pearl Sings,” set in 1930s America, centers on two polar opposite individuals: Susannah (Emily Dorsch), a straight-laced musicologist, and Pearl (Lisa Gaye Dixon), a no-nonsense woman incarcerated for castrating a man she claims is “evil.” The two form an unlikely friendship around Pearl’s penchant for singing traditional tunes, taught to her as a child during the slavery era. Susannah, driven by her own heritage of Celtic music, hopes to record the tunes so they live on after Pearl dies, but Pearl’s interests lie in finding her missing daughter. To satisfy the two interests, the women take the music on the road in what results in an interesting dynamic between the opposing personalities of the two characters. The show takes a minimalist approach to what is essentially equal parts music and acting, and the result is charming and heartfelt. Dixon’s sultry vocals, performed both a cappella and accompanied by an autoharp — a small, stringed, folk instrument — come off as genuine, particularly the darker songs dealing with death. For example, during Pearl’s first performance, the audience of the Kitchen Theatre acts as the actual audience for her performance, and the crowd participation provides a deeper connection between the audience members and the performers. The women’s odd-couple dynamic often grows boring, and the plot quickly becomes predictable, but the songs help make the dull moments of dialogue more lively. However, the acting is an equally significant factor. Dixon’s performance is beautifully natural as she delivers lines such as, “I’ve got a father in hell, a daughter in Houston, and I’m gonna see one of them tonight.” Her wild mannerisms and stone-faced expressions add a three-dimensional aspect to her performance. Dixon executes the role of a woman not quite comfortable with accepting help from someone whose race has oppressed her family through slavery for generations. One particularly moving scene the two actresses share is when their characters learn about the tragic fate of another character. Pearl feels guilty for having fun and blames Susannah for having put the show together in the first place. Both characters appear as if they could either get into a shouting match or break down in tears at any moment, yet they remain silent and motionless. It is these moments of little to no dialogue that hold the most gravity in the show. “Black Pearl Sings” explores many different themes, albeit subtly, but the most interesting topic touched upon is the awkward relationship between African-Americans and whites only half a century after slavery was abolished. In this case, Susannah wants to help Pearl, but Pearl’s prior experiences make her distrusting of her for most the first act. Race relations in the United States have improved greatly since the early 20th century, but it is still refreshing to have a play that asks the question of how far this issue has actually come.